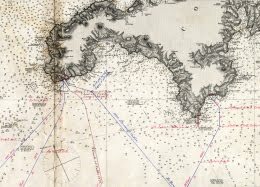 Porthcurno has a unique historic provenance: this is where the telegraph cables that linked Britain with its Empire and other nations came ashore. The valley was the hub of international cable communications from 1870-1970 and also training college for the communications industry until 1993. Porthcurno was the largest cable station in the world. 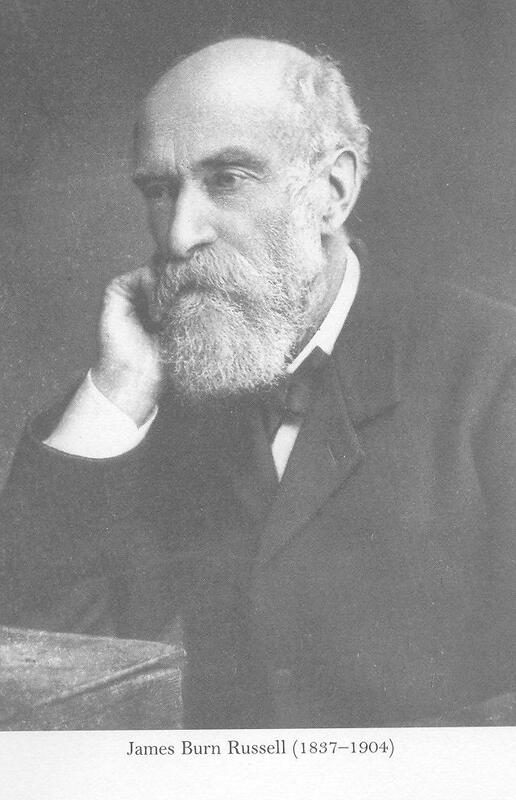 This man is James Burn Russell ( 1837-1904) best know as Glasgow's first Medical Officer of Health. He happened to be at Glasgow University studying under William Thomson ( Lord Kelvin) when Thomson was seeking assistants to accompany him on the 1857 ( and later 1858) Atlantic Telegraph cable laying trips..........and off he went ! I am very grateful to John Burnett and Alison Taubman curators at Museums of Scotland in Edinburgh for introducing me to this character and in particular his manuscript journal which he kept during his entire time with Thomson on the voyages and the fraught days on Valentia Island ( August-October 1858) when Dr Whitehouse was endeavouring to communicate with Newfoundland and was allegedly at loggerheads with William Thomson. Russell's journal written for his sister Aggie is wonderfully detailed, he was clearly a very astute observer of everything happening both in and around the cable station. He was obviously "Thomson's man" which makes it even more interesting to read of his admiration and support for Whitehouse particularly his comments about how the Directors of the Atlantic Telegraph Co were, even then, in his opinion judging Whitehouse unfairly. The manuscript journal is a very hard read, feint and difficult to transcribe in places. It is held at Glasgow City Archives ( Mitchell Library) under reference TD1434/1. It is an important document in relation to the Atlantic telegraph cable of 1857/8 and is currently providing me with useful details in the work I am doing on Whitehouse. If you are interested but are unable to get to Glasgow and/or spend the time trying to decipher his manuscript there is another account which Russell wrote and was published in three parts in "The West of Scotland Magazine" in the " New Series " No59, 1859. It was titled "Leaves from the Journal of an Amateur Telegrapher" I should add that this is a much more romanticised and less technical account of his experiences than the journal. Nevertheless to find new, detailed, contemporary and "on the spot" accounts of the voyages and events on Valentia is rare and very useful. Historians to date have usually taken positions either denigrating Whitehouse and his instruments and/or trumpeting the virtues and scientific approach of William Thomson and his mirror galvanometer (or both !). One can only hope that with interesting and useful information coming from sources such as the Russell journal a more balanced historical perspective will eventually emerge. Do you happen to know of any records of James Burn Russell's family, particularly his father, David Russell, who was a printer and publisher. I am living in Australia so accessing records in Glasgow is not easy. A search there for "David Russell" returns quite a few page numbers with matches, so it may be worth your obtaining the book.